I finally got the speedometer up and running again! I bought a new speedometer cable down at the auto supply store (the old ones were stuck up) and had it installed. Went for a test drive...nothing on the speedo but zero! So back to the drawing board. I had the mechanic check the speedometer gear attached to the transmission and saw the culprit...the plastic gear has been shredded. I went to Nissan and found an eighteen tooth speedo gear for a five speed roadster (color code is blue) and bought it since there wasn't any gears left for the four speed. This will have to do...with a little bit of tweaking of course. The four speed speedo gear shaft is longer than the five speed gear so I had to go to the machine shop to have the necessary adjustments. 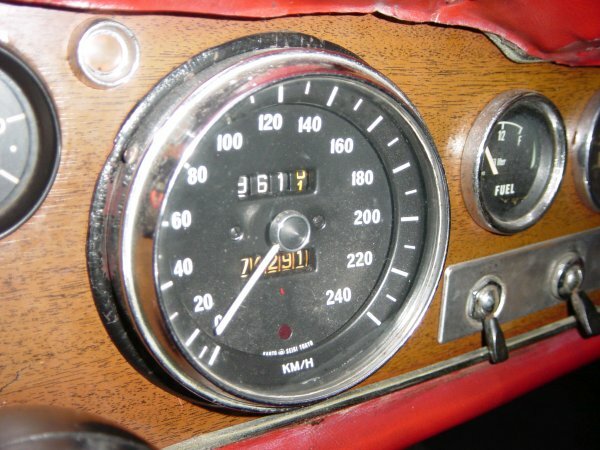 I had the lower end of the four speed speedometer gear cut and attached to the upper end of the five speed speedo gear to get the right length and woala...an eighteen tooth four speed speedometer gear conversion. The speedometer works great...although I'm not sure about its accuracy. I might be driver faster than the speedometer actually registers. I'll have to have someone in another car pace me so I can know what my true speed is. Well at least it works!